The camera interface is among the many things that Apple chose to redesign with iOS 7. And now that we've taken a look at it first hand, we're pretty content with what Jony Ive and his team have crafted. The new UI is pretty much as simple as it has always been, yet makes taking photos with your iPhone or iPad even more fun. Eight camera filters are available in the iOS 7 camera interface, available at the tap of a button. By automatically fine-tuning settings like image saturation, brightness, contrast and hue, they alter the image giving it an artistic or vintage look. The user is presented with a live preview of each filter in action as the frame is being taken, and in case they want to apply one to a photo after it has been already captured, that is totally possible via the image editing menu. Another cool thing you can do with iOS 7 is to zoom in and out while shooting video. That is done with a pinch-in or pinch-out gesture. Unfortunately, the zoom is of the digital kind, so those close-ups may result in image quality degradation. The option to snap photos while shooting video is present as well, but these shots are still taken at a resolution of only 1920 by 1080 pixels. That's pretty much all that's new in the iOS 7 camera interface. Now feel free to take a look at the samples we took using an iPhone 5. How do you find the new filters? This is a photo taken with an iPhone 5 running the iOS 7 beta. No filters have been applied and the HDR setting is off. The following 8 slides demonstrate how the different photo filters built into the iOS 7 camera interface alter the image. This photo we took with the HDR setting turned off. And this photo we took with the HDR setting turned on. Note that the sky is actually blue in this one while it was white and overexposed in the previous sample. Moving objects, however, have ghostly duplicates of themselves around them – a common flaw caused by the way smartphones take HDR photos. A panoramic photo taken with an iPhone 5 running iOS 7. The feature is available in iOS 6 as well. This photo was taken while shooting 1080p video with our iPhone 5 running iOS 7 beta. That is done with the tap of a button. Note that such images are saved with a resolution of only 1920 by 1080 pixels, not in the camera's native 8MP resolution, but it's better than nothing. This is the iOS 7 camera interface. 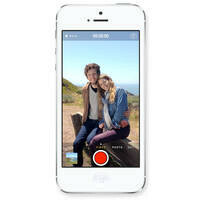 Swiping left or right switches between camera modes – Video, Photo, Square and Panorama. The button int the lower right-hand corner is used to apply the built-in camera filters. Tapping on the HDR button turns the mode on or off. With iOS 7, you can actually zoom in and out while shooting video.That is done with a pinch-in or pinch-out gesture. The zoom is of the digital kind, however. The 8 camera filters in iOS 7. Square mode takes... square photos. The panorama interface in iOS 7. The arrow in the middle guides you as you swipe the phone to the side. Excellent, can't wait for the new iPhone, and ios7. The awkward moment when Symbian already had this feature a couple of years ago.. OMG!!! I have never seen any phone on earth do anything like this before. This is the best innovation mankind EVER invented. I can't wait to upgrade my phone!! !